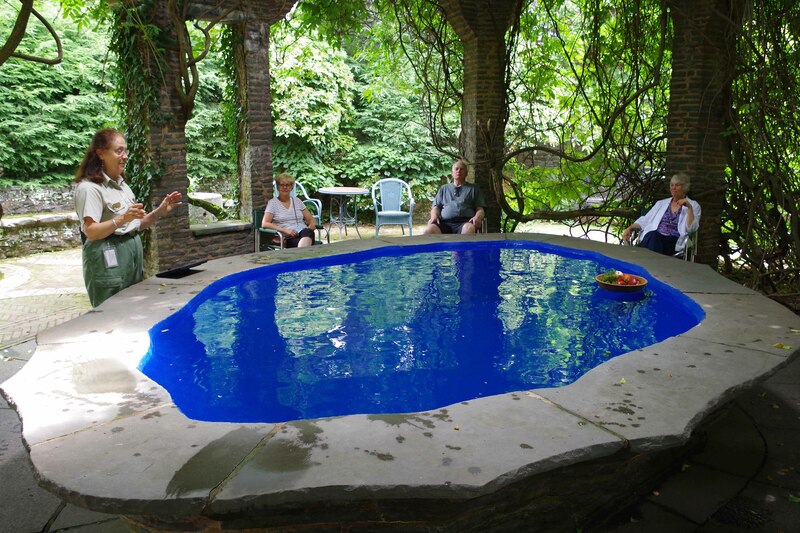 Any journey of hiking through history in Pennsylvania should include a stop at Grey Cornelia Pinchot’s watery dining table. I was aware of Gifford Pinchot when embarking on a yearlong journey of hiking through history, Pennsylvania-style. His wife, Cornelia, was a mystery. Gifford was a two-time Governor of the state more famous for serving as the first chief of the U.S. Forest Service. In fact, as a contemporary of Teddy Roosevelt, he pioneered forestry as a career and as a calling, coining the term “conservation ethic” to describe his vision for the wise, sustainable use of the nation’s natural resources. He was able to pursue such dreams because he was born into immense wealth. 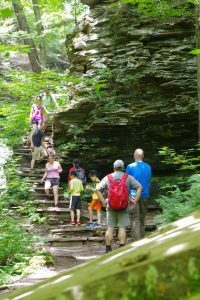 Hiking through history at Ricketts Glen State Park. The family home, Grey Towers – maintained these days by the Forest Service – is reflective of that. Pinchot’s study is spectacular. His fly rods are there (some hidden in the woodwork, where they were always at hand when he needed to take a break and chase his beloved brook trout). Classic, expensive and yet field-worn rifles and shotguns sit in familiar spots in a cabinet, too. All around are the books that make up an impressive library. But the outdoor dining table is all Cornelia’s. No shrinking violet – she was an early and vocal supporter of women’s suffrage – she loved entertaining. Many of the nation’s leading scientists, journalists and politicians, among others, visited the Pinchot’s castle-like mansion near Milford, in Pike County. Cornelia didn’t like gathering everyone around a traditional, rectangular table, though. That limited conversation. People talked only to those to their right and left. So she had workers build a “table” that’s really a small pool. Guests bellied up to its stone rim and passed food all around, in every direction – and thereby talked to everyone else — in floating bowls. No less impressive than all that, though, are the grounds. They’re a joy to hike. One of the official trails is short — less than three quarters of a mile – but leads through the woods where the nation’s first foresters were trained. Also Leopold, the father of wildlife management in this country, was among them. 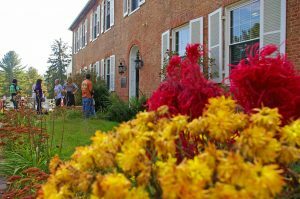 Pine Grove Furnace State Park is home to lots of hiking and history, like this Ironmaster’s Mansion that serves as a hostel for Appalachian Trail hikers. It’s a fascinating hike, one of 40 that I traveled while exploring the state’s history. You can see them all in the resulting book, Hiking Through History Pennsylvania, which you can see here. Released this summer, it includes hikes short and long, urban and remote, difficult and easy. But all showcase elements of the state’s history. Sidewalk Trail in Presque Isle State Park in Erie County, for example, connects a monument to Oliver Hazard Perry – he of “we have met the enemy and they are ours” fame – and an 1873 lighthouse. The trail itself, meanwhile, is the path trod by school children traveling to Misery Bay, where they caught a boat ride to class (in Erie winters, no less). Then there’s the hiking at Kinzua Bridge State Park near Mt. Jewett in McKean County. 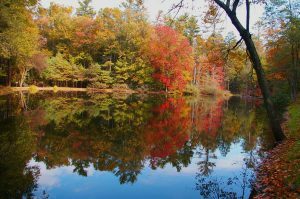 What looks like a natural lake is in fact a man-made water source, created for the iron furnace at what is now Caledonia State Park. In 1881, Thomas Kane, a Civil War veteran who wore a full beard to hide one of his several battle wounds, had a problem. He was president of the New York, Lake Erie and Western Railroad Coal Co. He had to get coal, oil and timber from the rugged woods of McKean County to markets in Buffalo. In the way was Kinzua Creek valley. Three hundred feet deep and half a mile wide, it was a major obstacle. Kane had two choices: detour his railroad eight miles around the valley, or lay tracks in a zig-zag pattern, down one slope and up the other. He chose neither. Instead, he commissioned engineers to build a bridge – just the tallest and longest the world had ever seen, that’s all – across the valley. They did, and it lasted for more than a century, until a 2002 tornado sent a large portion of it crashing to earth. What remains standing is restored, complete with a viewing platform. What fell lies scattered in a debris field. Hikers can wander both while exploring the park’s history in a newly-expanded visitor center. Pennsylvania has a lot of hiking like that, where time outdoors mixes with a look to the past. Oil Creek State Park – site of the world’s first successful commercial oil well – offers spectacular trails winding among leftovers from the oil boom. The Flight 93 National Memorial and Gettysburg National Military Park are home to more somber hikes. 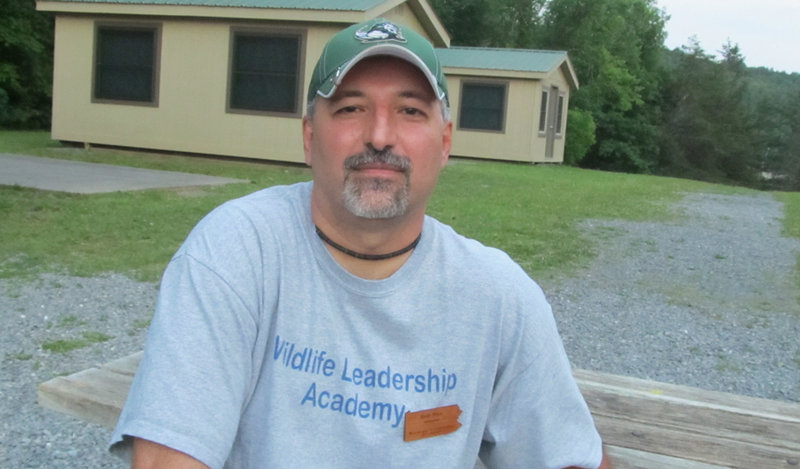 Delaware Water Gap National Recreation Area has charms of its own, as well. Then there’s Friendship Hill National Historic Site, where hikers can see lots of wildlife, take in views of the Monongahela River and explore an ancient cemetery, all while learning about one of the most important, yet least known, architects of the American Revolution. There’s a lot of history to walk out there, and it’s varied. Some of it is industrial, some military. Other hikes link to conservation history. There are still more tied to architecture, politics, wildlife and even resort-like entertainment. Add it all up and it’s a history-loving hiker’s dream. So go explore and make your own history. Adventure awaits, just as it did long ago. 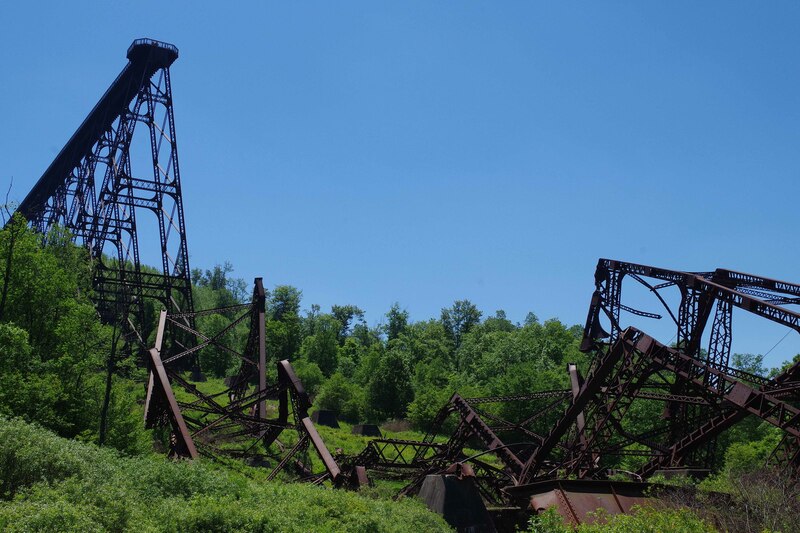 A look up at what remains standing in Kinzua Bridge State Park from the debris field.